In collaboration with architects Perkins+Will, members of Atelier Ten US volunteered their time to design the first environmentally sustainable mentoring module. 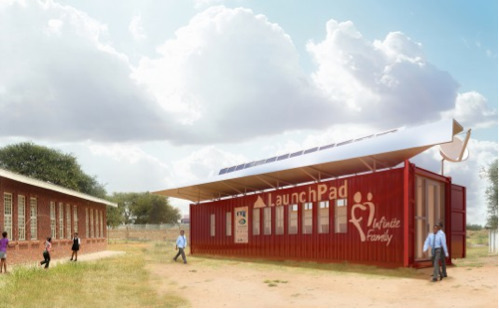 Called LaunchPad, it uses a repurposed shipping container for the Infinite Family initiative in Sub-Saharan Africa where millions of children grow up without the influence of adults. Amy Stokes, the program’s founder, wants to change this. As such, there was an overriding imperative for this project to be extremely economical, both to build and maintain. Infinite Family’s first state-of-the-art module marks an important milestone for the program. 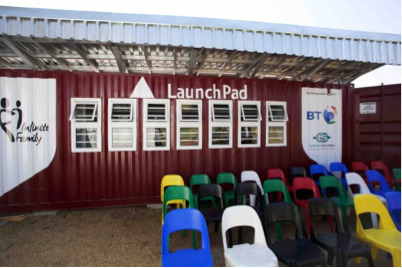 While there is a strong precedent for using repurposed shipping containers as low-cost buildings in Africa, this unit utilizes passive cooling, an interactive thermal wall composed of recycled water bottles, and battery-powered back-up storage banks to allow them to function off-the-grid when necessary. With as many operable windows as possible for natural light and cross-ventilation, an over-sailing canopy on the roof gives the LaunchPad a strong identity while providing deep shade to help modulate the interior temperature. LaunchPad is truly the state of the art for distance mentoring. It’s a place that signals that important work is being done by the mentee and their mentors, and it’s a place where students come to invest in themselves and develop the self-reliance they need to build better lives. Due to the AIDS epidemic in the region – one in ten people are infected with HIV – a disproportionate number of children and young adults are growing up without parents or without adult mentors. In response, Stokes’ Infinite Family enlists volunteer mentors from around the world to interact one-on-one via web video with at-risk youths, forming lasting relationships and helping them to become assets to their communities. The program has been a great success. More than 400 mentors have given their time, engaging some 600 children over the last three years. Infinite Family is helping young people gain skills in five areas: communications, academics, life skills, technology and career preparation. These skills and the self-reliance they bring are a real source of long-term sustainable impact. The expectation is for the mentored teens to go on and create better lives for themselves and contribute towards a stronger society. And along the way, they are very engaged in gathering plastic bottles to create the thermal wall. Atelier Ten’s project team included Paul Stoller, John An and Chad Groshart.